The final part of a good Ironman race plan is the recovery. I’ll admit that I don’t always practiced what I’m about to preach. Strategies have ranged from weeks of inactivity and heavy eating to daily cycling and careful dieting. I’d recommend finding a middle ground as a far more sensible and reliable approach. Once you cross the finish line recovery begins. Your priority has to be fluids and nutrition you’ll be dehydrated and depleted and the sooner you deal with this the better. Find the food tent immediately and eat whatever you can stomach. I know many find it difficult to eat after a race, but it’s essential you take something on board. Fluid replacement is particularly important so start drinking – soup is a great option if it’s available. Don’t get worked up over quality, eat what appeals. At ITU Worlds last weekend I had some of the fruit then sampled every cake on offer! On a couple of occasions I’ve showered and had a massage first only to find myself light-headed or on the verge of fainting. Not a pleasant experience so eating early is my preference. Eat a little before you clean-up then come back for a proper feed. Event massage is a mixed bag and I don’t always use it. It will be light with a focus on improving blood flow to aid recovery. If you use massage I think it’s better to arrange a session with your regular therapist following the race. They’ll have a much better idea of what you need and be more willing to work on you. For the rest of the day enjoy yourself, eat whatever you like and however much you want. Drink plenty and if you’re disciplined about anything make it rehydrate. I know I’ve done a good job if what little sleep I get that night is interrupted by several trips to the toilet! You’re lucky if you get a good night’s sleep following a race. I rarely last four hours from a combination of physical soreness and mental energy. The mind is buzzing from the excitement of the day. There’s no point worrying about the first night’s sleep you can catch up over the coming week. I continue to allow myself to eat and drink what I like figuring I’ve earned a day of unhealthy eating even if it is the time to be more focussed on nutrition. After weeks of strict dieting I need the mental break. Usually my appetite is still in overdrive and I’ll eat lots. Despite not having rules I’ll ensure there’s a mix of fruit and veg in there too you can’t live on cake alone. Keeping active boosts recovery. I may not rush out on a training session, but will ensure I walk about a lot at least. It’s a matter of keeping muscles gently moving and getting the blood flowing. Good options are swimming or an easy spin on the bike. The impact is low and you can do these without significantly pushing the body. 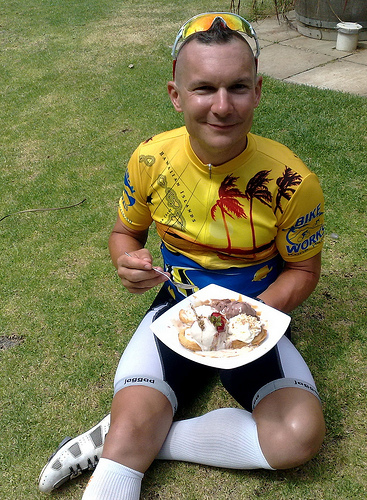 One of my best recoveries came after Ironman Western Australia with a long ride to an ice cream store. This is where I tend to get derailed and what I describe here hasn’t always happened! The week after an Ironman is still entirely about recovery. Even if you feel great this is not the time to be testing your fitness. Exactly how you approach recovery comes down to where you are in your season and future plans. If it’s the end of your season things are much easier. My advice is simply chill out, relax and enjoy yourself. Keep active to help the recovery process, but don’t even think about training. Go out on the bike or go for a swim if it’s what you want, but the only plans you should have is where the coffee stop is. It’s worth tapering back the excesses as the week goes on or your risk a tougher start to the next season. On the other hand if you’ve got more events lined up you need to bear this in mind. I still advise no structured training, but you definitely have to taper back excess consumption. I’ve been weak on that point and the result is a tougher time preparing for the next event (or worse failing to be well prepared). My rule now is a treat each day, but otherwise return to my regular diet. By the end of this week I expect to be off the processed foods entirely. Whilst I say no structured sessions, if the next event is close you need to increase active towards the end of the week. Typically I’ll be swimming and cycling at the least and there’s a possibility I’ll have run. Be cautious with the latter as the potential for injury is huge. My first runs are easy to the point that I expect to be passed by old ladies on their way to the shops! Any faster and I’m working too hard. Once again if the race brought your season to a close you can take more time to recover. Just continue the behaviour from the first week. Allow yourself the odd treat, but keep it in moderation. Slowly introduce more activity into your day, sticking to easy sessions and a focus on fun. As the month passes you can start to consider going longer and perhaps genuine training. 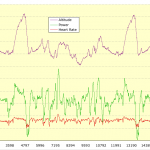 My aim is to be swimming as normal, regularly cycling and back to short runs by the end of the month. Not my usual volume, but daily training none the less. With more events ahead I aim to bring structure back into my life in the second week. From that point on diet and weight are monitored and I start scheduling workouts again. The focus is still easy sessions of shorter duration, but I’ll drop anything I don’t feel up to. The body is still recovering and doesn’t need testing yet. You may feel great a couple of weeks after your race, but you’re not there yet. Don’t be lured into testing fitness you’ll get away with a hard session, but likely find the impact on your body is huge. Recovery from going too hard too soon can take a while. The third week is when I aim to return to normal. It will still be quite relative and the rule about dropping workouts you’re not up to still stands. However I’ll try and have a full schedule in place with more sessions comparable to my basic week. Of course if you do something silly like race Roth and Ironman UK with only three weeks between them this is a taper week! By the final week I expect to be entirely back to normal training both in volume and mix of intensity. The process to get me here has been gradual and always focussed on ensuring that I was physically and mentally in good shape. Trying to do too much earlier in this month can lead to mental burn out or injury. I always remember that I want to return to training with a real desire to work and without niggles or injuries to manage. Ultimately how you work your recovery will come down to your future goals and the speed with which your body repairs itself. Whilst my past schedule hasn’t always given me much time for this process I do recognise its importance. My five week break after Ironman New Zealand was the result of too long a period of mental and physical focus. I simply couldn’t take the intensity anymore and had to step back. Well managed recovery periods minimise the risk of burn out and ensure continued enjoyment and development in the sport. They also help to avoid excessive loss of fitness or growth of the waistline.